What makes a super star in the classical music world? Is it prodigious talent? Yo-Yo Ma is one of a handful of classical musicians who falls in this category. With the changes in the recording world where record companies used to make stars, Yo Yo Ma falls into the category of being one of the few classical artists who as Welz Kauffman, CEO of Ravinia, says can sell out a show. There are many child prodigies, and conservatories are filled with extremely talented musicians. I think the answer to what makes a super star lies in the less tangible qualities that Yo Yo Ma and few others have. They are great communicators, not just musically, but they have the ability to connect with people, and take the time to do so. Here's my Yo Yo Ma story that illustrates this belief. Years ago I took my 12 year old daughter to hear Yo Yo perform at Symphony Center. After the concert, we joined the long line of people outside the green room who wanted to get his autograph or talk to him. I had a Polaroid camera and young cellists we knew kept asking me to take their photo with Yo Yo which I was happy to do. When it was our turn, I snapped the photo, and much to my daughter's dismay, the photo was lousy. Going to the car, her tears were flowing, so I decided to go back and ask if we could take another photo. He put his arm around my daughter whose face was all puffy and red from being upset, and said, "Now, get it right now, Mom!" He then let her play on his cello, so I left with a bright faced, happy girl. A super star is someone with talent, but also charisma, compassion and a giving heart who builds their career by being interested in other people and other ideas. 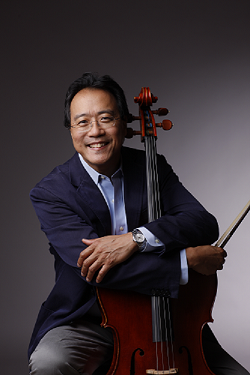 No better a person to exemplify than Yo-Yo Ma with his creative forays into not only classical music, but American bluegrass music, traditional Chinese melodies, and Argentinian tangos. Do you have a Yo-Yo Ma story to share? Actually, I do! A few years back I was flying back from Boston to Chicago on a business trip, and I was lucky enough to get upgraded to first class. As luck would have it, I wound up being seated next to Yo-yo's cello, and Yo-yo was sitting across the aisle from me, with his assistant. Near the end of the flight I worked up the courage to talk to him, and I found that he was the easiest person to talk to. He told me that he mostly practiced the cello 'in his head', which I thought was really interesting. At the time I had played the violin in a while, and when I shared this with him, he encouraged me to pick it up again. I think he even said 'next time I see you Jennifer, I hope you're playing'. It is one of my favorite stories :).